Kassiblog: An 84th Legislative Session Retrospective: "Robust Primaries in 2016; New Leadership in 2017"
An 84th Legislative Session Retrospective: "Robust Primaries in 2016; New Leadership in 2017"
I think it is pretty safe to say that this 84th Legislative Session was disappointing where pro-life measures are concerned. Some may be more diplomatic about it than that, but I don't have to be. It was not terribly successful, but not for lack of effort by pro-life stalwarts. Even those successes that were achieved took a great deal more effort than they should have to ensure even incremental improvement. I am most concerned with end-of-life/denial-of-care issues on the pro-life spectrum these days. so let's start there. (Abortion is important, too, of course, but I feel most called these days to work (to the extent I can) at the other end of the spectrum.) HB 3074 was initially a deeply flawed bill that could not be supported as it was. Through a tremendous amount of work, particularly and especially on the part of Texas Right to Life and certain truly good pro-life legislators (listed here), it was substantively amended and could be supported as an incremental improvement. It is, however, just a beginning to the reforms necessary to this draconian law we know was TADA (the Texas Advance Directives Act). HB 3074 was signed into law today by Governor Abbott. And, let me say, it was really interesting to watch the House floor debate on HB 3994 and then the Senate floor debate on it. Sen. Perry was a rock star. As an attorney, I was most impressed by how he handled himself, the questions posed to him, and his calm, informed demeanor throughout the lengthy debate. If you can, I encourage you to watch these debates and committee hearings online. (In the blue box to the right, you will see links for video broadcasts for each chamber.) I also encourage you - if you have a strong stomach - to venture onto Twitter during these events. It is good to see what both sides are saying about it. You learn a great deal about the mindset of both pro-abortion activists and politicians. There were other excellent, solid bills that were submitted that would have provided more patient-centered reform to TADA, but politics interfered. Texas Right to Life has the most comprehensive pro-life legislative retrospective and within it is a bit of the backstory as to why more pro-life legislation was not passed. The bottom line is that some in the House leadership (the same leadership problems do not exist in the Senate) proved to be a tremendous obstacle to pro-life legislation. I emphasize some in the leadership because there are a number of excellent legislators in the House who worked tirelessly to toward these pro-life victories. They worked in ways seen and unseen. They deserve our thanks, support, and prayers. Remember, there are internal party politics that are messy. When principle is put above that, these House members really need our support. There were modest gains, but they were just that - modest. Moreover, the battles required to achieve these modest gains are indefensible. What can be done? Plenty. Let this be our battle cry for the sake of the unborn, the elderly, the ill, and for truly conservative values in Texas! There are too many who, by claiming a particular party affiliation, imply (and sometimes flat-out claim) certain values and principles which are completely absent after they are elected. This cannot continue. There has to be principle over party and party politics. There has to be a willingness among the electorate to oust even an entrenched incumbent when that person fails to deliver. In many cases with some of the House leadership, we have many sessions of evidence that shows that that person is not a conservative and is unworthy of being awarded the privilege (not the right) of re-election. Let me be perfectly clear: The electorate must act. We must encourage individuals to run against the powerful, incumbent, entrenched, establishment - whatever label you want to use - politicians who have not fulfilled their campaign promises, who lost their way, who sold out, who are not committed to saving lives. Term limits are not the answer. An informed, active, involved electorate and robust primaries are the answer. We saw some stunning changes to the Senate which made a difference this session....and it all began in the 2014 primaries. And, life issues mattered. The same needs to happen in the House. Straus was challenged this year in his bid to be re-elected Speaker. NINETEEN brave, committed souls opposed him. I have come to refer to them as "The Principled 19." It was not enough, but it was a start. 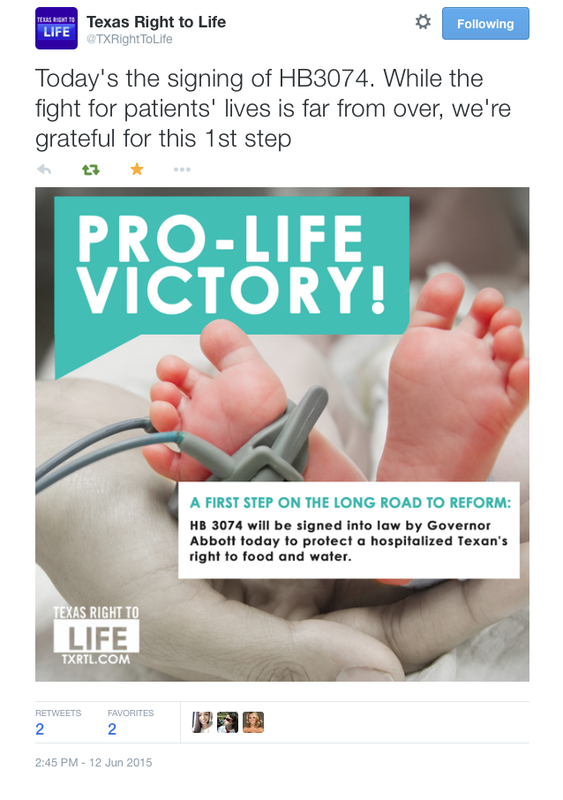 We knew that once re-elected, Straus and his lieutenants, such as Cook, would harm pro-life legislation. And they did. The evidence is abundant. Let me also be clear that when I say "leadership" I am not only talking about the Speaker. Committee chairman positions are very powerful. The members of the Calendars Committee are very powerful. For those who would point to successes such as HB 2 (recently upheld in the Fifth Circuit), as some evidence that Straus is pro-life or that pro-life gains were made under his leadership, I remind you that it took TWO special sessions to get it passed. TWO. Special sessions can only be called by the governor who is the sole person who determines what issues will be taken up during that session. HB 2 should have passed in the regular session. Straus, those who identify closely with him, and any who serve to undermine, if not outright oppose, substantive pro-life legislation, must be removed from office and/or their positions of leadership. One more word on this: Be very careful which groups you look to for endorsements in the coming primaries. Many groups will give their endorsements. At least two other pro-life organizations in the state endorsed or were otherwise apologists for Cook, Straus, and the rest of that part of the House leadership responsible for the paltry pro-life gains we had with a nearly two-thirds Republican majority in both chambers.